Okay, so the first part of our Fallout Shelter strategy guide for protecting Dwellers from radiation covered a lot of important details. But we’ve only scratched the surface of what we’re here to talk about – how to protect the people in your vault, a.k.a. your Dwellers, from radiation. 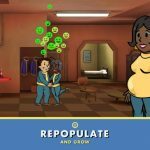 So if you’re ready to do more learning, we suggest you keep reading on, preferably with your iOS or Android device on and Fallout Shelter loaded up for easy reference. In the early goings, your Dwellers won’t get any stat increases, though you will eventually get a chance to create new rooms, i.e. the gym, that will allow your Dwellers to improve their SPECIAL stats. Still, there is another way to give them a stat boost, and that’s by having them wear special outfits. These outfits can be found in Lunchboxes or when your Dwellers go exploring in the Wasteland. You may also be welcoming some new Dwellers who are wearing something out of the ordinary, something you can potentially use to help improve their stats. Simply select a Dweller and tap on the outfit icon – this will allow you to view all outfits that are available to be worn by that Dweller. Upgrading the door to your vault is often overlooked, but in this game, a well-upgraded door could do a pretty good job in staving off enemy attacks. Raiders will often try to barge into your shelter, each of them wielding deadly weapons; they will then steal your resources and use their weapons to kill at least some of your Dwellers. But you’ll have a better chance of keeping them away (albeit temporarily) if your vault door is upgraded. While Raiders will eventually enter your vault, a high-level vault door could keep them at bay for a few additional seconds, allowing you to come up with a battle plan. It’s quite interesting to note that Raiders won’t drop by your vault too much if they notice that your vault door has been upgraded. 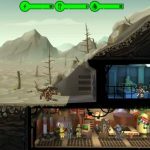 In general, you can assign any two Dwellers to guard your vault’s entrance. But what if their SPECIAL skills don’t suggest a good defense against invading Raiders? If they don’t, then you don’t want them guarding the door. What you would want to do is to gather the highest-end weapons you’ve got and equip them on your top-level workers. If they’re guarding the door, there’s a good chance they’ll be able to destroy the Raiders before they could head to the next room in your vault. Now, you may think this is silly – we’re talking about saving your Dwellers from radiation, but why send them to the Wasteland? The answer is simple – the Wasteland comes with bottle caps, lunchboxes, free experience points, and other wonderful freebies that may help you in your game. But when you send Dwellers to explore the Wasteland, you should always have them bring along some Stimpaks and RadAways – the latter, once again, is what will keep them from radiation damage. It’s imperative that you have them bring both, because long explorations typically lead to better-quality, and more loot from the Wasteland. Tap on the Collect button once your Dweller returns home, and heal him or her with Stimpaks and RadAways – it’s dangerous to let irradiated individuals walk around your vault with free reign, ad radiation is contagious in this game! It is possible to swap one Dweller in your room with one in another. 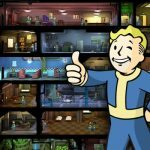 We’re mentioning this because of the sheer unpredictability of events in Fallout Shelter – Raiders could invade your vault, Radbugs can spread radiation, and fires are a common occurrence in general. But you don’t need to get in a tizzy if any of these events happen. If you’ve got Radbugs and fires to deal with, what you can do is to “borrow” a Dweller from another room and drop them into the place where the fire is blazing or where the Radbugs are attacking. These Dwellers will sort out the issue, and once that’s done, you can return them to their previous rooms. Two hundred is the maximum number of Dwellers that can stay in one vault, and in order to reach that magical number, you will need men with high Charisma stats and a radio station, of course manned by someone with high Charisma figures as well. Charisma allows Dwellers to quickly impregnate their partners, and helps the radio station’s DJ drum up support in his own inimitable way. But before you try to increase population to the max, you should make sure that you’ll be able to support all those Dwellers. Stringing together several pregnancies in a row is sound strategy, and it is possible to chain about ten pregnancies or more in this game. Radio stations, on the other hand, draw in new Dwellers at a much slower pace – let’s put it at one new Dweller every few hours. Last, but not the least, one good way to keep your Dwellers free from radiation is to leave the game. No, we’re not telling you to stop playing forever, but rather for a few minutes, or right before you go to bed. While there’s a whole lot of maintenance that has to be done in order to ensure a lot of tasks get completed in the time you’ll be out (making sure everyone has enough food or water to consume, lest they become irradiated), the good thing is that you don’t need to worry about any Raider or Radbug attacks, or fires taking place. There is one final caveat, though – your resource storage may get depleted quickly, so with that in mind, you want to check the status of your vault at least one time per day.